Our seven year old is a unique specimen, as are we all. But the Gort has caused us, his parents, to gnaw on our fists in astonishment more times than I can recount. Astonishment at the violent blend of smartitude and ‘donkey’-like stubbornness that is his personality. To know the Gort, is to recognize that there is no convincing him to do something he does not want to do. Take swimming, for example. All the first graders at his school participated in six swimming lessons at a local pool. The Gort, who had not seen a swimming pool in a year, was placed in the lowest ability group and spent six lessons…….wearing a life jacket and hanging out in the shallow end. He’d decided that the swim instructor could not be trusted to keep him from drowning in deep waters, so he declined to do most of the prescribed activities: the ones you need to do to move on, to Swimmer 2. Hence we are now driving him to the bowels of the northwest quadrant of the city twice a week, so he can repeat Swimmer 1 and possibly learn to swim by the time he gets his driver’s license. And, true to form, this time it’s a different story. He jumps in the pool* when asked to do so, and allows his new instructor to guide him in the pool through the intricacies of front floats and back floats. ‘I want to move to Swimmer 2,’ he balked-opined last week, as though Swimmer 1 was suddenly beneath him and a waste of time for someone of his ‘ability’. In addition to becoming the next Michael Phelps, the Gort can also be found on the soccer fields twice a week. We were driving to the game last night when he muttered ‘I wonder if Ali will be there tonight?’ ‘Who’s Ali?’ I had to ask. Ali, it turned out, was a little boy who’d attended the first few games and then disappeared, never to be seen again. When we got to the field, there were all of four boys wearing maroon jerseys. The ‘Warriors’ would be severely understaffed, it appeared. 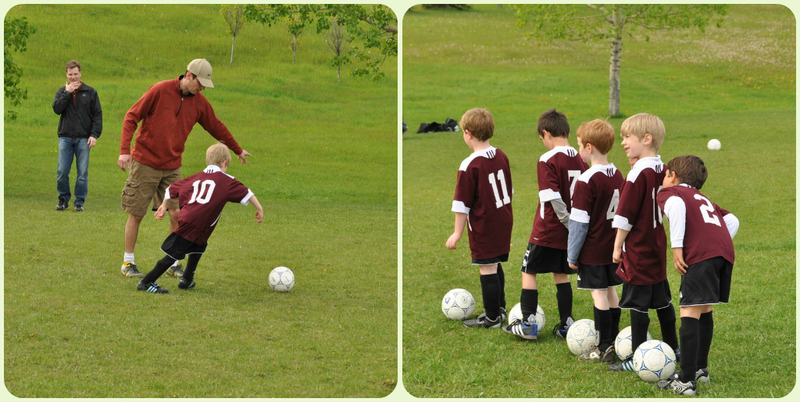 A few minutes later a small brown-haired boy sporting a maroon jersey ran onto the field. I summoned the Gort to learn if this was the Ali he had talked about in the car. The Gort stood beside me gazing blankly at the field before him. My seven year old shielded his eyes from the sun using his hands like a visor. ‘Which boy? I don’t see anyone.’ As he rotated his head from left to right. ‘Number 3’ I explained, with more than a modicum of exasperation…….seeing as there were four maroon-shirted boys on the field. ‘I don’t see a number 3,’ he replied. Dumbfounded. Bear in mind, I had turned his head in number three’s direction. I had pointed at the anonymous child’s position on the field with my finger. And still he pretended he couldn’t see him. ‘The kid standing right behind your friend,’ I finally replied through slightly clenched teeth. So, not Ali. And I’d lost five minutes of my life I would never get back. When we pulled up to the curb in front of our house an hour or so later, his eyes were closed. Was he asleep? Worn out from the emotional distress of losing to a team of second graders? I stared at his face, saw his eyes were fluttering and his top lip was curled into a very slight smile. He was pretending to sleep. ‘Mmmh, I wonder if anyone would like some candy,’ I asked….no one in particular. His eyes remained shut, he was determined to outlast me in this made-up game. ‘Well, I’m going to go in and have some ice cream,’ I announced, as I pretended to head to the house to eat my imaginary bowl of frozen dairy. But he was immune to that trick too. I needed to get creative, to dig deep. His eyes popped open and he turned around in his booster seat to see….absolutely no one. ‘Gotcha,’ I crowed. More than a little bit pleased with myself. ‘How about a small Lego set from the Lego store?’ the Gort suggested. Um no, I was thinking more along the lines of…. a marshmallow. ‘Why won’t you give her a hug?’ I asked, not entirely surprised by his revelation. *Update: He jumps into the pool, yes, but jumps out no farther than a millimeter, so he can touch the edge of the pool…..at all times. Brace yourself, little Warrior; you are going to be hugged a LOT next month.